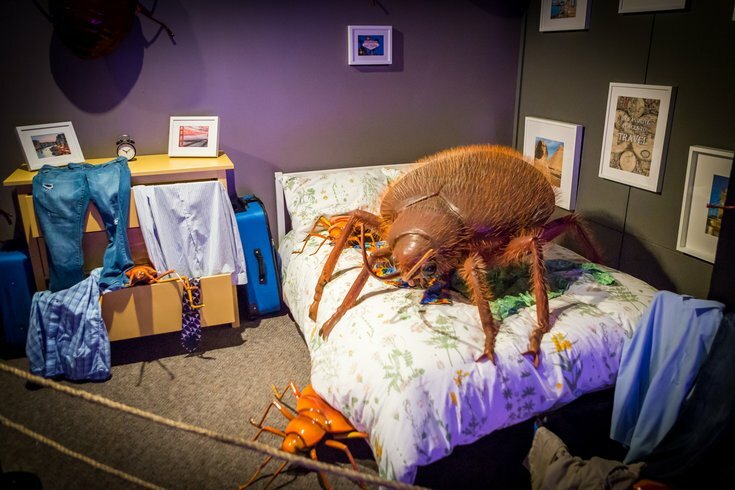 A large bed bug crawls atop a bed in the Extreme Bugs exhibit at the Academy of Natural Sciences. 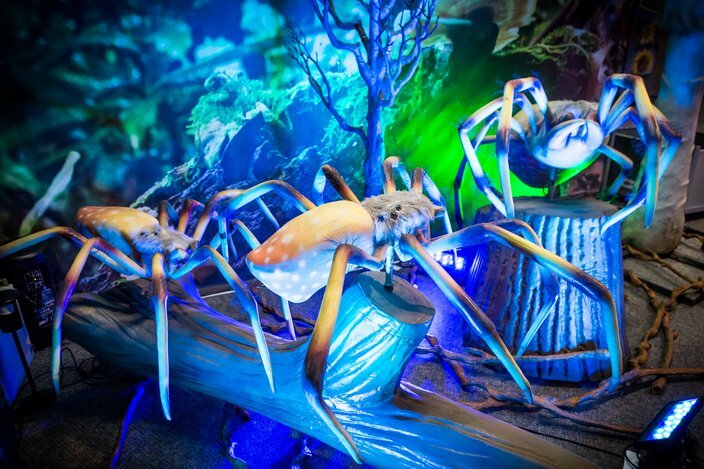 Just in time for the summer insect infestation, Xtreme Bugs is a new exhibit now on display at the Academy of Natural Sciences, sure to either make your skin crawl or make you say, "Ahh!" 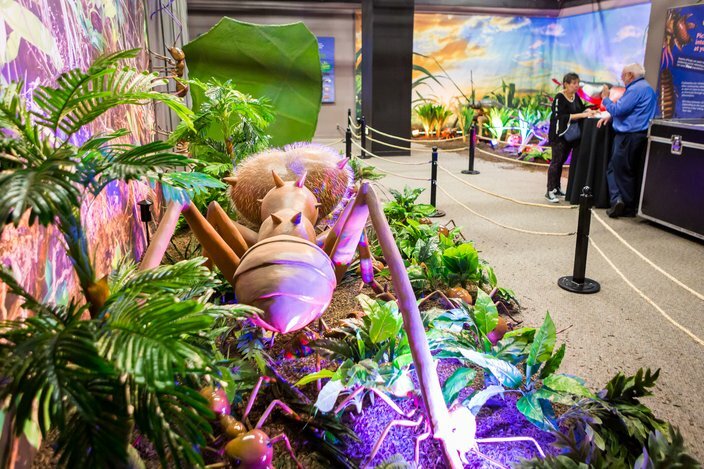 Running through January 21, 2019, the Xtreme Bugs exhibit features the mind-boggling behaviors and characteristics of some of the earth's most interesting insects, but on a giant scale. On display are 20 massive, moving, mechanical, hissing, clicking insects, including an 18-foot long wiggling centipede, a five-foot-long, blood-sucking bed bug and a 12-foot-long pink orchid mantis. Xtreme Bugs blends technology, science, artistry and imagination to capture the most interesting aspects of the insect world. Cost: $7, nonmembers; $4, individual and family members. Free to all Family Plus members and above. For information on the exhibit, click here. 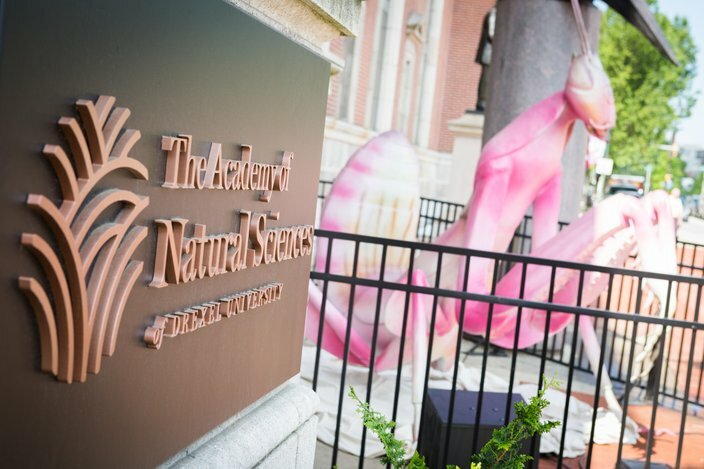 Look for the giant 12-feet-tall hissing, pink orchid mantis across from Logan Square near the entrance to the Academy of Natural Sciences. 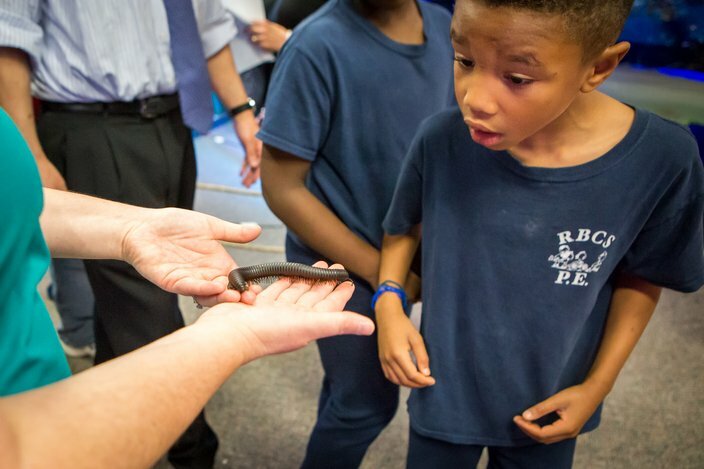 Students from the Russell Byers Charter School check out an African Millipede at the Academy of Natural Sciences. Brown Marmorated Stink Bugs look out near the entrance to the Extreme Bugs exhibit at the Academy of Natural Sciences. 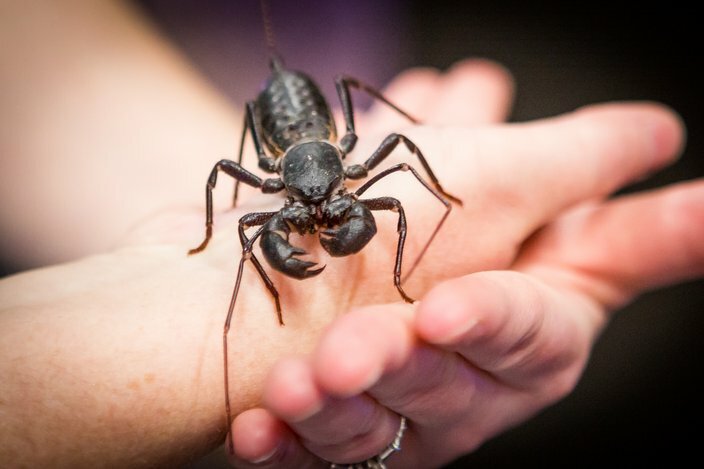 Invertebrate specialist at the Academy of Natural Sciences, Karen Verderame, shows guests to the exhibit a Vinegaroon scorpion. 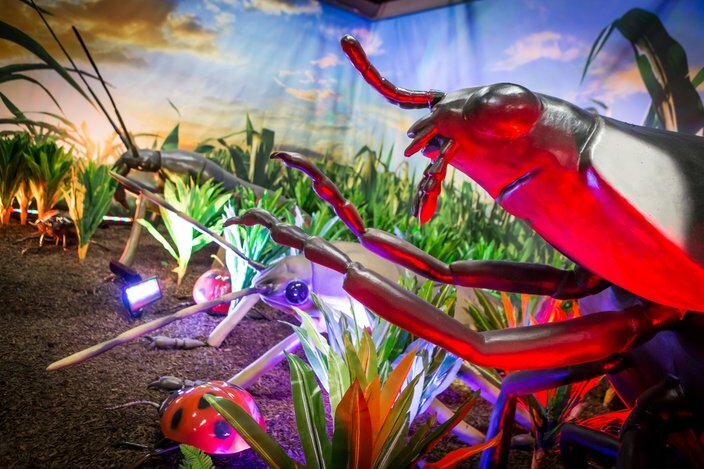 A giant firefly lights up while a Vinegaroon scorpion at moves around in the Extreme Bugs exhibit. 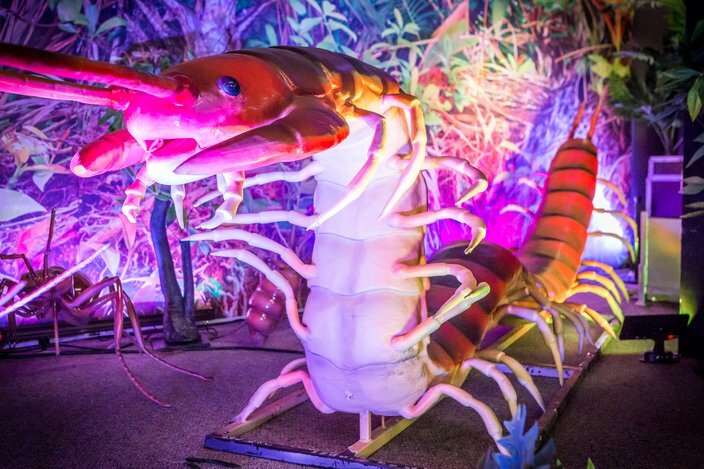 An 18-feet-long wiggling centipede is one of 20 giant insects in the exhibit. A group of giant orb weaving spiders take perch on a log in the Extreme Bugs exhibit at the Academy of Natural Sciences. 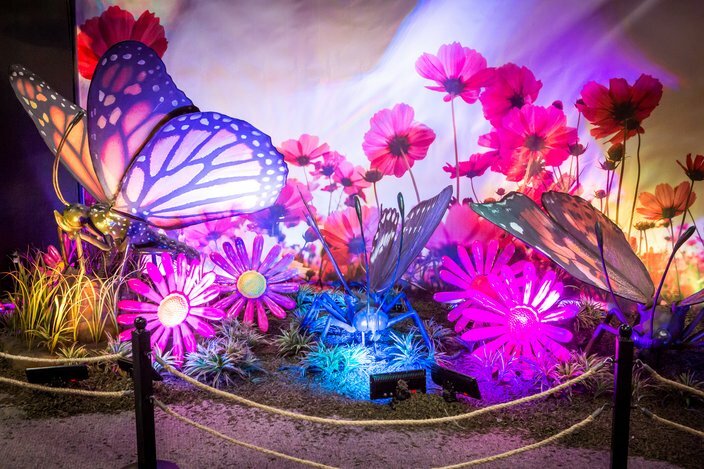 Monarch butterflies gently flap their wings while illuminated with a palette of colored lights. 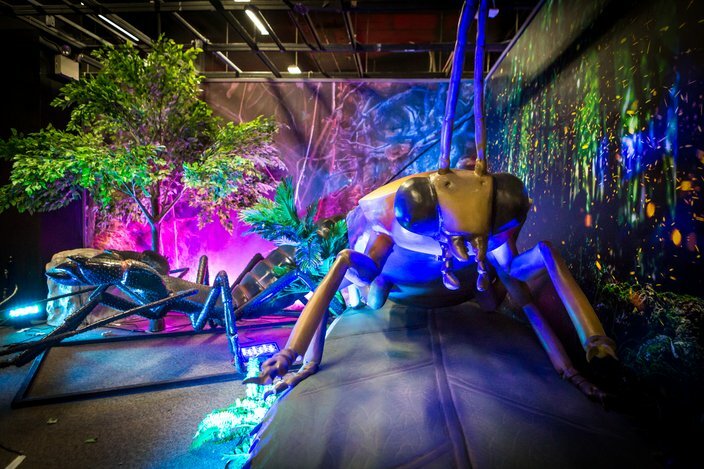 The exhibit gives users an up-close view of 20 giant moving, hissing and clicking insects from around the world.